There is volumes of research demonstrating the positive health benefits of moderate wine consumption. It is important to note that Resveratrol is found in the skin of red grapes. Malbec has a thick skin and contains much resveratrol. Vine grapes grown in cooler climates have higher resveratrol levels than those from warmer climes (such as California and Spain). The varieties with most resveratrol in the wine include malbec, petite sirah, st. laurent and pinot noir. Moderate wine drinkers are 23% less likely to develop dementia and/or Alzheimer’s disease. Resveratrol, found in fairly high levels in wine, is a naturally occurring antioxidant that decreases the stickiness of blood platelets and helps blood vessels remain open and flexible. It also inhibits enzymes that can stimulate cancer cell growth and suppress immune response. 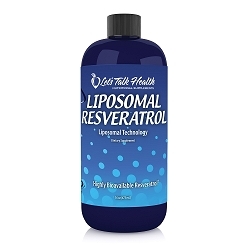 While we appreciate a nice glass of wine in moderation, if you are really looking to increase your levels of resveratrol, our Liposomal Resveratrol will allow you to absorb much high levels than other delivery methods. So enjoy a glass of red wine with dinner tonight, but also try Liposomal Resveratrol to combat the oxidative stress in your cells and assist you body in living healthier and longer.